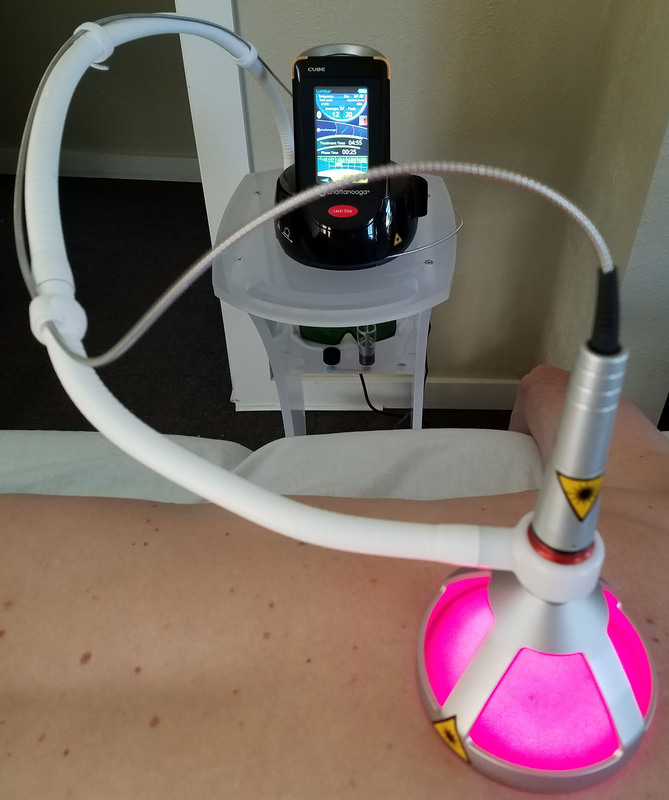 For some buyers, the ability to use a therapy laser in an hands-free setup is a major factor in their selection process because it can reduce the cost of the therapy and allow them to treat more patients. For home users, it allow them to treat themselves without forcing a family member to operate the laser for them. In either case, it can make laser therapy much more convenient. For those with a busy practice, the option to perform other work during the laser therapy session allows for better work flow, higher dosages with less time required by the doctor and a more profitable practice. It can also help customers feel like getting a lot for their money even though the doctor is not treating them the whole time because the are getting more therapy time. Hands-free systems can significantly improve the return-on-investment since the practitioner can treat more patients in the same time and pay back their laser purchase faster. For home owners, it allows for a more comfortable therapy session and it can be the only reasonable option for single person with a problem that is hard to reach like mid and lower back pain. It can also be worth the investment to have a hands-free system for those with chronic conditions that might require years of therapy. Many people are tricked by the "time savings" promise of unattended therapy. Systems like the $40,000 CE™ robotic laser take 2-3 minutes to set up and then they deliver a maximum of 3.3 watts for 10 minutes for a total of 1980 joules (3.3x60x10). 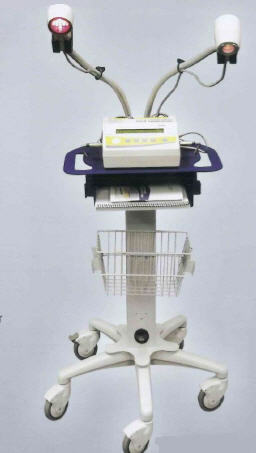 An Eltech K-Laser class 4 laser will deliver the same dosage in about 2 minutes (15x60x2.2) and cost less than $20,000. If you really care about saving time and money, robotic systems are not the answer. Before we start to review all the options for hands free systems, let's review when unattended therapy is NOT appropriate. Hands-free systems are not used for veterinary or equine therapy. There are unattended LED systems that are built into a wrap for these applications but the dosages a small fraction of the dosage you can get with a laser. Any system that focuses the energy down into a point probe is not application for hands free operation. This is because the treatment time for trigger points and acupoints is less than 1 minute per point (typically 20 to 30 seconds) so it would be pointless to try and walk away from a fast moving laser puncture session. Unattended therapy is also not applicable for most class-4 systems including the Aspen, Nexus, Pilot, , LiteCure™ and Apollo systems. This is because the output from their emitter is high enough that it must be kept moving in many cases to avoid tissue heating. Leaving a patient alone with one of these lasers is just too risky. Also, these systems can delivery power so quickly that they can deliver the same dosage that you would target in a typical unattended therapy session in just a couple minutes or they can deliver much higher dosages in the same amount of time. Unattended operation is not appropriate for some lasers because of the treatment times are very short. Both Microlight and Chattanooga Vectra Genisys have typical times of 40 seconds per area so there is not enough time to leave the room before you need to change to the next setup. With most attended therapy protocols, the laser is constantly moved over the treatment area because the treatment area is larger than the laser emitter area. In general, there is not much difference between applying 10 joules per point manually over 10 one inch treatment points or 100 to all 10 treatment points at the same time but there are 2 differences. In attended therapy, the emitter can be pushed into the skin to displace some blood allowing for a slightly higher energy efficiency in pushing the energy directly to deep damaged cells. There can be some loss in air due to absorption of energy into the dirt floating around the room. Both of these reductions are relatively small so typically the dosage is increased by a small percentage to offset the losses. The following is a list of some of the lasers on the market that are appropriate for unattended operation. The first option for unattended operation is the TerraQuant series of lasers like the TerraQuant Pro, LS50, Elite and even the TQ Solo. Like their big brother, The MR4 lasers, these class 1m systems use super-pulsing technology so that they are totally safe and they cannot cause eye damage or any tissue heating. The Magna cart series allows for the placement of multiple emitters and it can be easily moved from room to room. The flexible arms are very easy to get into a variety of configuration for treating conditions like a rotator cuff injury. 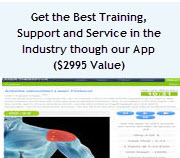 With this system, you can treat both the front and back of a shoulder at the same time. The protocols for the TerraQuant laser typically require 3 setups at about 5 minute per setup so that allows a practitioner to easy check on other patients during each step. Multiradiance also sells an inexpensive arm that can be bolted to an existing table for a very low cost hand free system. All Terraquant lasers are slightly divergent so you can move the laser away from the treatment area to enlarge the treatment area. TerraQuant systems also use advanced pulsing technology for better results. On of the best class 3b hands-free options is the Avant LZ30 series of lasers. Avant lasers can be snapped into the holder on a rigid boom-style stand (which only cost $250) for unattended operation.Â This laser used a slight divergent optical design so you simply back the laser off the treatment area until it covers the desired area, turn on the laser and then leave. This system will operate on the battery or plugged in. With this system, there is no chance of tissue heating (but patients should always wear safety goggles during an unattended therapy session). The Avant has both red and IR wavelengths. In the IR wavelength, it delivers 84 joules per minute in continuous wave mode. The result is about 840 joules in a 10 minute unattended therapy session. If you occasionally need a "class-4 laser dosage" for a very difficult case, just let the system run longer. It can deliver 840 joules in 10 minutes and at a faction of the cost of most class 4 system. For those who the best of all worlds, the ultimate system on the market is the Eltech K-Laser system build for Chattanooga with the extend plus option. This Italian made "gold standard" laser system can quickly be switched between hand held and hands free therapy making it the most flexible laser on the market. The Cube 4 does both continuous wave and pulsing in up to 4 different wavelengths with 810nm being the primary. Their internal protocols allow for up to 12 automated steps in the any therapy plan. 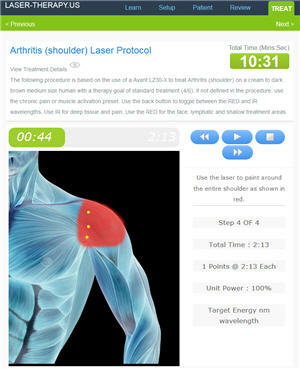 This system has a treatment area of about 4 inches when the spacer is in contact with the skin and this system delivers up to 15 joules per second (9000 joules in 10 minutes) so it allows users control of every variable understood to increase efficacy in a laser therapy device include dosage, pulsing and wavelength diversity. One other unattended super-system is the PowerMedic GigaLaser. With 36 watts in a giant array attached to a massive roll-around power supply, it can deliver an incredible 2160 joules per minute so dosages in the 20,000 joules take just 10 minutes unattended. The treatment area is so large that you typically treat an entire back in just one setup. This system is so large that you are never have to worry about missing a problem area with the laser. It gives an even distribution of energy over a 140 plus square inch area. Erchonia™ lasers are usable for unattended therapy but they are some of the lowest power lasers on the market. Their systems are 20 or 50 mW so there is no risk of heating. A typical 20 minute unattended session give the patient less than 24 joules in 10 minutes over the entire treatment area. If you are treating a large area, the density can be much less than 1 joule per centimeter at surface and about .1 joules per centermeter at depth so this is extremely low compared to any other system on the market but they somehow make up for the lack of power with their pulsing technology. Another unattended option (that we do not sell but is worth mentioning) is Cutting Edge™ lasers. 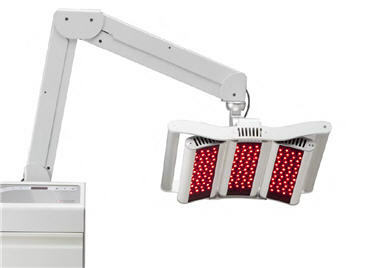 These systems use a robot controlled small laser beam to scan the treatment area. These systems have a big wow factor for patinets but in general, it is a very complex and expesive solution to what can be done alot better for a lot less money with a stationary system. These machines are often available at huge discounts because they are so complex and maintain them is ultra-expensive so many buyers give up on them. These systems deliver 3.3 watts so you get 1980 joules in 10 minutes. The cost is over $35,000. These are the major players in the unattended laser therapy field. If safety is a major factor, the TerraQuant system is a great choice, If flexibility and the option to treat a wide variety of conditions, then the Avant is a great option because it can deliver both attended and unattended therapy in 2 different wavelengths, with both pulsing and continuous output and it can do both broad coverage and pinpoint therapies with an adapter. If you are not financially limited and you are looking for the ultimate system, the Chattanooga Cube by Eltech K-Laser will do automated CW and pulsed wave in 4 wavelengths in an unattended system that will really blow your patients away with higher dosages and faster noticeable results.